In The Spirit of the Laws Montesquieu observed that near equality of wealth amongst the citizenry is essential to a functioning democracy. Something of that understanding must reside in the collective American subconscious, notwithstanding our overt acceptance of the unlimited accumulation of wealth, since an alarm has been sounded about the influence of money in politics. It is obvious that there can be no real republic where the government is influenced primarily by the wealthy; that is, by definition, a plutocracy. What’s more, there are few Americans who enjoy the belief that the United States has not become exactly that. Efforts to return the nation to republicanism can hardly be called revolutionary, since that is the form of government contemplated in our Constitution. It is the plutocrats and their governmental minions who are the revolutionaries, for they have worked to deny us the most basic guarantees of our supreme law. But what is to be done? The most common response to the problem is to call for restrictions on how much money can be donated to political campaigns. But this is only a superficial and ineffective solution. Even if the amount of money that can be donated to campaigns and political parties is restricted, there is nothing that stops people from disseminating their views, and their support of candidates, outside of campaign and party structures, and it is the wealthy who will by far have the best ability to do exactly that. Yet restricting citizens, even wealthy ones, from expressing their views through the common media would violate the First Amendment, and the idea is to save the Constitution, not destroy it. Since the Citizen’s United  decision much has been made about corporations spending money on political speech. The word “corporation” tends to be used as a synonym for a big business, but it is really only a way in which people organize themselves. Even a small mom and pop grocery store can be incorporated. A law against corporations engaging in any political speech (and even after Citizen’s United they still cannot donate directly to campaigns) can easily be circumvented by wealthy individuals organizing themselves informally. There is a slogan going around enunciating the truism that money isn’t speech. Money isn’t a can opener either, but you’ll probably need some to buy a can opener. Who seriously denies that running a political advertisement on television or in a newspaper isn’t speech? But these things have to be purchased. Even the humble offering that you are now reading required the purchase of computer equipment and monthly payments for electricity and internet service. While the saying is a truism, its intended application is simple nonsense, and thus can be of no practical use. So are we left to the sinister devices of the 1%? Not at all. One thing that the Constitution is absolutely clear about is that the government has the power to tax. With that means, the government may also limit the amount of income one acquires. 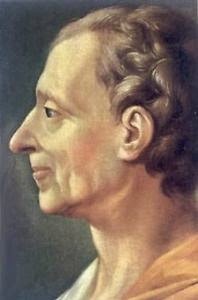 The aforementioned Montesquieu, who was so influential with the Founding Fathers , wrote in 1746 that in a democracy it should be “the business of particular laws to level, as it were, the inequalities, by the duties laid upon the rich, and by the ease afforded to the poor.” This could be accomplished by taxing all income above a certain level at 100%. Some will immediately protest that such a remedy would destroy the incentive to industry. In response, one can call to witness the many who go to work every day without even the benefit of a living wage. People work hard even when they have no hope of making enough money to buy a politician. The legendary laziness of humanity has been greatly overstated. There is only one effective remedy for the purchasing of politicians. It cannot be done with laws that are ineffective, nonsensical, or violative of constitutional rights. The only way is to make it impossible to become wealthy enough to make such purchases. If we take this course we will at last achieve a democracy that Montesquieu would recognize as such, and which would be worthy of the name.